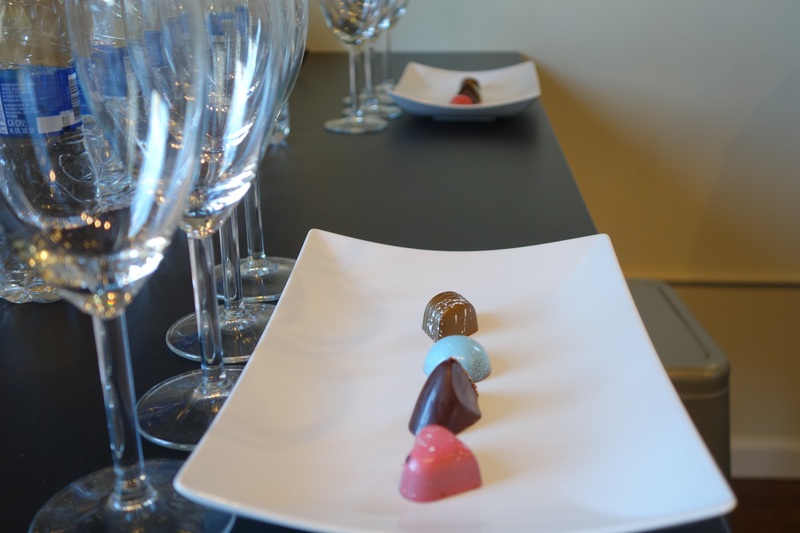 Elegant chocolates go smoothly with varietals. I had already spotted their bestselling chocolates, the dark chocolate salted caramels, when the woman at the counter pointed to the spiral staircase and said the seminar was about to begin. I carefully wound around curved steps and saw tables lined with wine glasses and plated chocolates. I assumed they were chocolates for the special tasting, but they looked more like art work and perfectly arranged. Muted hues, variegated colors and individually shaped made me wonder what they would taste like. 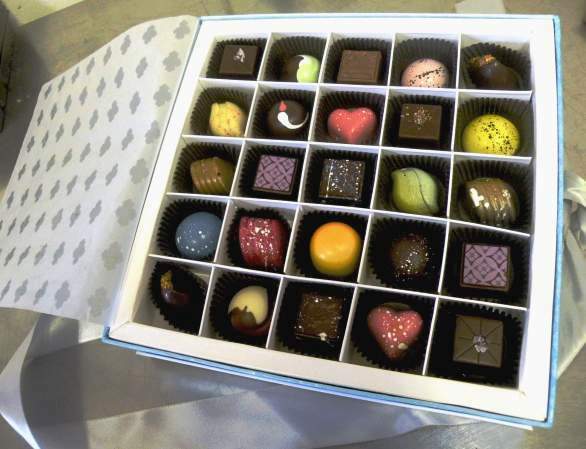 Dallmann’s Confections, located in the Headquarters at Seaport Village, San Diego, is well-known for exquisite handmade chocolates and Mozartkugel. Owner, Isabella Knack, has deep roots with the chocolate business, since she was raised in her family’s pastry shop in St. Gilgen, Austria. 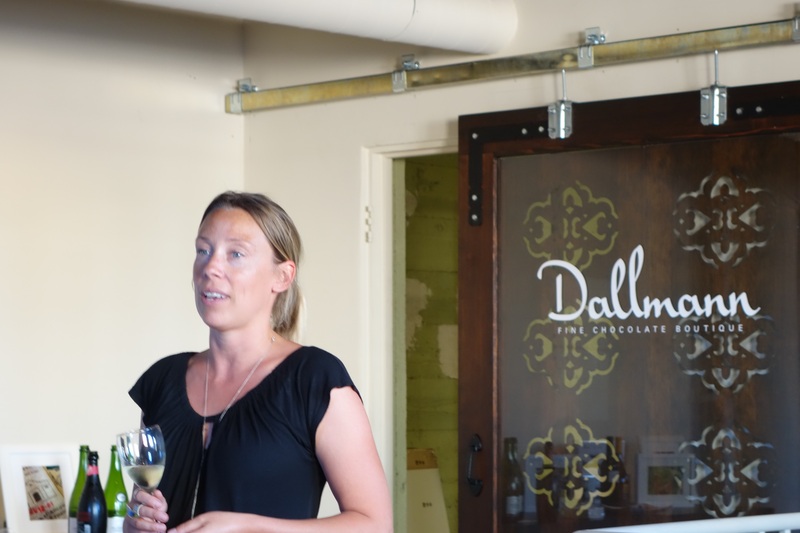 Her grandfather, Guenther Dallmann, taught her culinary traditions, and her parents still operate the pastry shop after many years. She came to San Diego on a student exchange program 20 years ago and decided this was the place for her to start her own confectionary business. She knew her business was on the right track when she began selling to upscale hotels, who placed the chocolates on pillows at night. Isabella was determined to continue the time honored techniques passed on from generations, and uses no mass producing machinery in her shop. She insists on the finest ingredients for her sweet treats, with high quality chocolate and marzipan imported from Europe. On this clear night in this intimate room near the belfry, Isabella and her husband, wine sommelier Jayson Knack, welcomed enthusiastic guests to take a place at the tall tables set for each guest. Isabella instructed us to take a bite of the chocolate first, then a sip of the matched wine. Jayson explained the key to wine and chocolate tasting is that chocolate is not sweeter than the wine. Also, acidity in chocolate has to be balanced with grapes ripened on the vine. The first edible delight was heart shaped and filled with rosewater caramel, which paired nicely with an Italian sparkling red wine. Spicy passion fruit, infused with togarashi spice from Japan, was the next confection, and a dry Sauvignon Blanc enhanced floral notes of the candy. The third wine, a California Petit Syrah, balanced the flavors of an organic blackberry jam covered in dark chocolate. Knowing we may need some caffeine for the road home, a mocha truffle made with espresso ganache and dipped in Swiss milk chocolate was paired with a Malbec. This tasting brought a new appreciation to swirling the glass of wine, smelling its bouquet and snapping the piece of chocolate. Isabella ended our adventurous evening by saying chocolates are as desirable as jewelry. Champagne, craft beers and artisan cheeses are other tasting events in this shop, with sensual aromas wafting in the air. If attending a tasting is not convenient, joining the chocolate club to receive seasonal assortments of decadent chocolates throughout the year will thrill the palate. Feature image courtesy of Dallman’s Confections.